The sign said spring chicks available for order at four dollars and seventy five cents each, with the first delivery of April 1st already filled, an indicator that a number of folks have now graduated towards the concept of fresh home pastured eggs in the raising of backyard chickens. Not residing in a community where such adventure would be permitted, contentment still inspires awe in the newness of the season upon us, the time of new birth and renewal. Despite continued cold, an area nursery center displayed limited vegetables readying for digging up the raised beds and preparing the soil among varied selections as red and green cabbages, leafy green kale along with an interesting variety of a more delicate, shapely cousin with pink tinged trim. There were Swiss chard and mustard greens, and inside the sliding doors requiring a good yank moving in and out was the warm interior nursery who’s long wooden planks set small containers of fresh herbs spreading tiny stems with sprouting shades and shapes showcasing another peek among the broader garden varieties shortly ahead. Not yet entirely motivated for setting down a worn metal shovel digging the defrosting soils, setting a solid plan for maximizing the seasons supply ahead is on the agenda, and with a twenty percent sale at the local Primex garden center the only regret was not picking up one of those cute garden plan books where one can map out in full detail the ins and outs of an efficient and abundant selection of choice foods that will fill between the cuts of washed out railroad ties precisely designed in rectangular arrangement. Renewal shows its face at every market in square silver tins lined with water hosting bunched green tipped stalks of the slender crisp variety, barely requiring merely a stingy snap of any vague toughness at its base, roasted with a bit of olive oil, salt, and pepper in short time yields full flavor along with its brightly retained color. Scuffed, dirt specked brown crimini mushrooms continue to flourish and combine flavors and textures harmoniously arranged in combination with the finished spring pencil shaped asparagus, further enhanced at center, bright white, golden yellow centered juices of a fried egg. 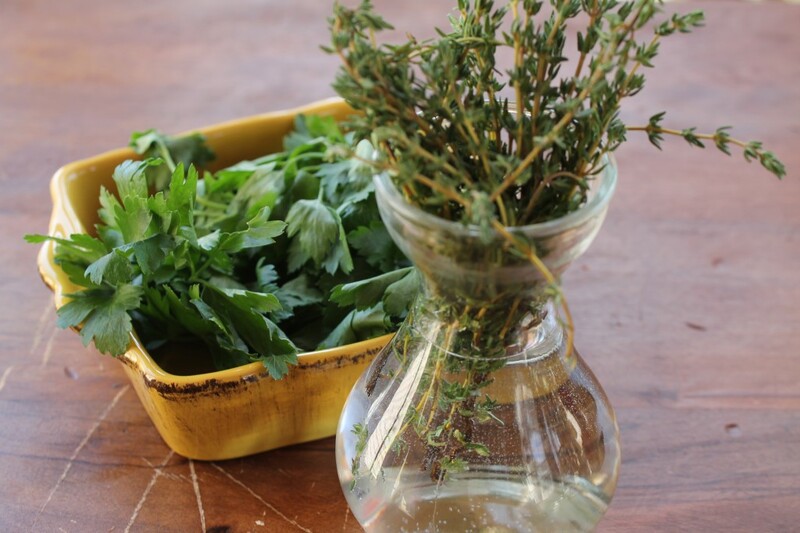 Stirred and scattered emerge fresher scents, more pronounced flavors than the season past, including more generous market bunches of herbs, large shaped leaves of Italian parsley and elegantly lengthy sprigs lined with budded thyme. 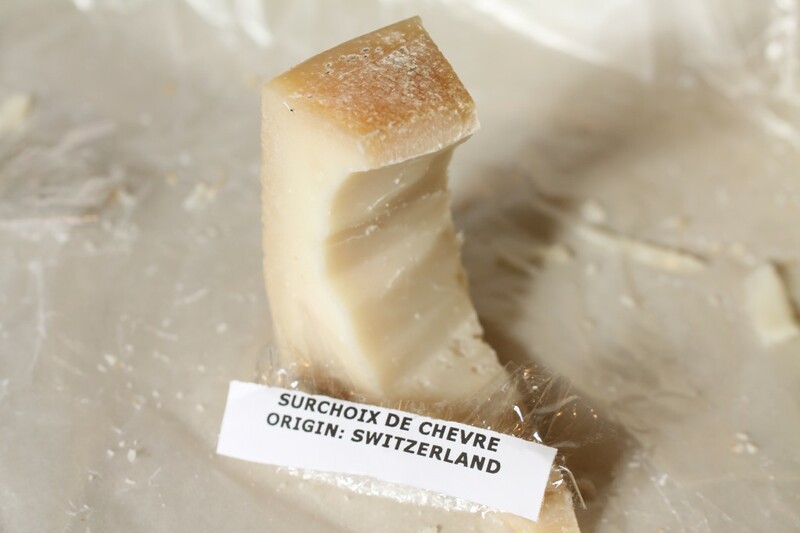 Now inspired too with a newly found cheese, Surchoix De Chevre, a creamy, pale, hard goat cheese imparting a mellow, flavorful tang. Imported from Switzerland, this unique find recently identified among the huge domestic and imported selections at Wegmans turned into a great new favorite, sliced then broken into small coarse size pieces tucks well into those renewed flavors bursting forth highlighting the new season, this year, particularly, and especially welcomed and appreciated, the breath of spring. Preheat oven to 350 degrees. Rinse asparagus leaving small water droplets clinging to stalks. 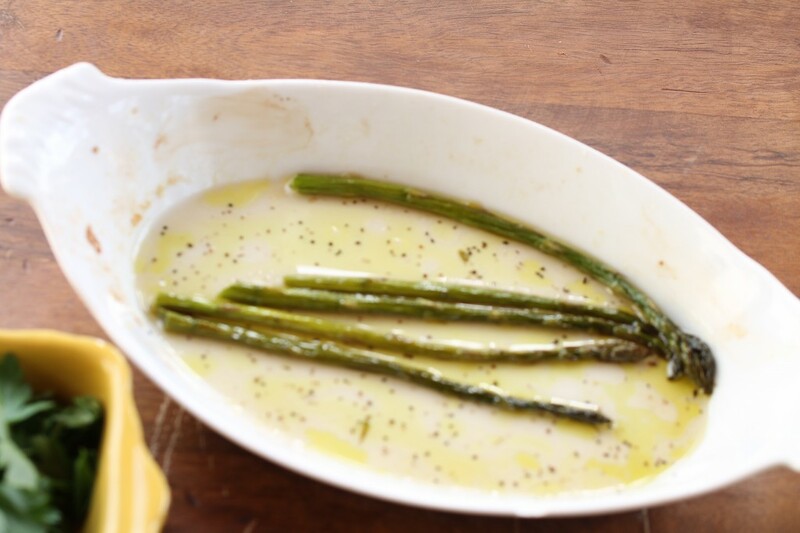 Using a glass dish, coat asparagus well all over with about one and a half tablespoons olive oil, a generous pinch of kosher salt and a good pinch of cracked black pepper, mix together well. Roast asparagus in oven until tender done about fifteen minutes, remove asparagus from oven and when cool to touch cut stalks on an angle about a half to three-quarter inch bite size. Heat a medium saute pan, pour in enough olive oil to cover bottom of pan, approximately, one and a half to two tablespoons. 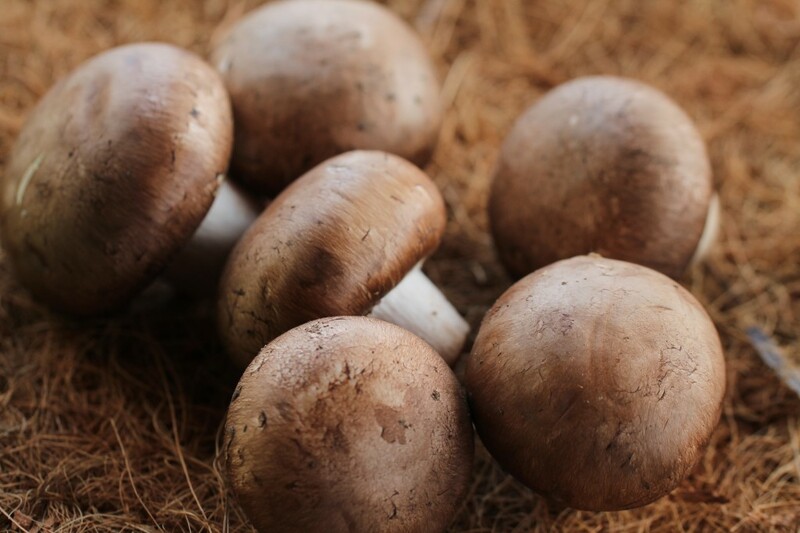 Drop mushrooms evenly around pan and cook on medium high heat without disturbing for about three and a half minutes until beginning to brown, then shake pan to cook evenly sauteing another three to four minutes. Add in 1 teaspoon chopped fresh thyme then sprinkle in a large pinch of kosher salt and a small pinch of cracked black pepper. Tilt the cooked, seasoned mushrooms into the bowl of roasted, chopped asparagus, stir gently. 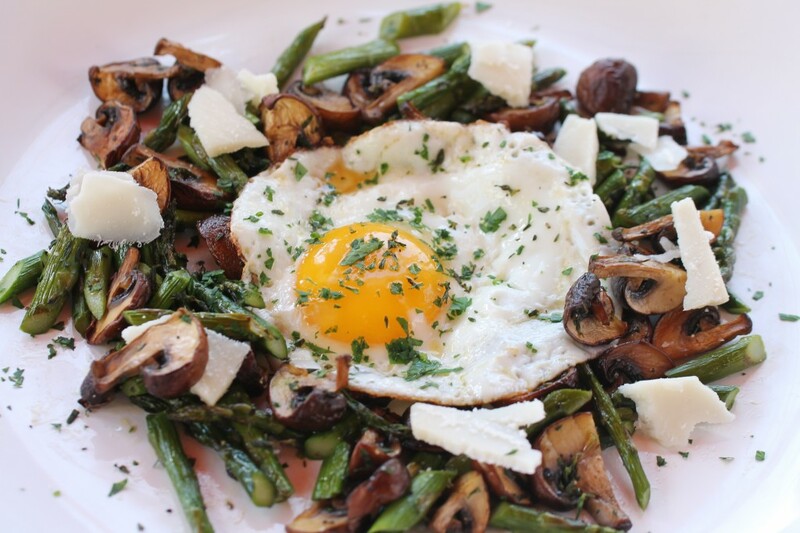 Arrange the asparagus mushroom salad creating an outer circle all around on each plate. Evenly place coarse broken pieces of the Sur Choix Chevre cheese tucking in around the vegetables. Heat nonstick saute pan, melt 1 tablespoon butter, slide in a whole egg and fry, covering with a lid for the last minute until done, sprinkle with a bit of pepper, salt only if desired. Immediately transfer the fried egg to the center of the plate surrounded by the arranged asparagus and mushrooms, sprinkle fresh chopped parsley and thyme over the egg and ingredients over the plate. This entry was posted in Breakfast and Brunch, Salads and tagged Asparagus, Asparagus Crimini Surchoix De Chevre, Crimini, Fried Egg, Surchoix De Chevre. Bookmark the permalink. Post a comment or leave a trackback: Trackback URL. Hi Chelsea, this is such an easy dish, so fresh and tasty and perfect for spring, I sure hope you do give it a try. Thanks for the pin! See you at chelsandthecity. Thanks for joining in. 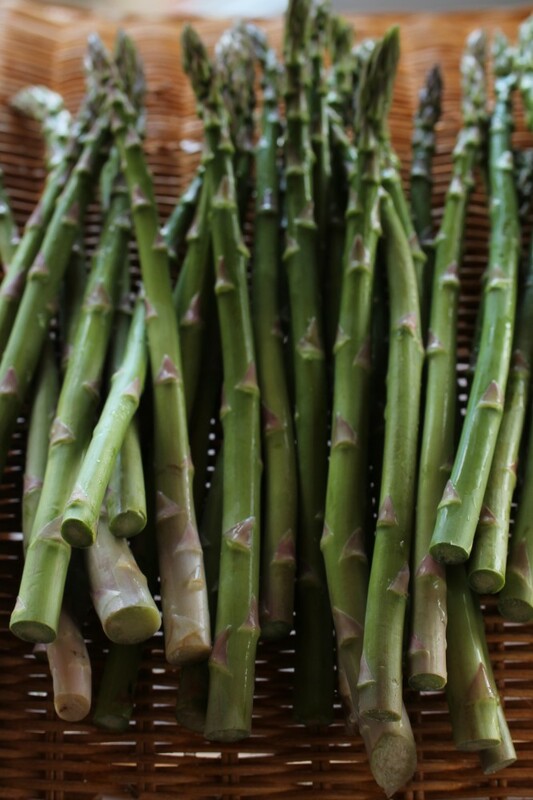 Thanks Faith, the bright green pencil-thin stalks all bundled together sure are perfect for spring, and in light of you being an asparagus fan, yes, versatile asparagus is enjoyable in so many different ways. Thanks for joining in. See you soon at design fixation. This looks like a lovely late morning breakfast meal. There is a spot by me that makes something similar which I’ve had with a bloody mary. Phil recently posted…I love eating a tasty box! Shoga sushi NYC. Hey Phil, agreed, and I would definitely enjoy this as brunch, even for dinner. Bloody Mary sounds good too. I’d love to know the dish that the place nearby you serves. Loved your Post on the Shoga Sushi Bento Box today! Thanks for joining in. 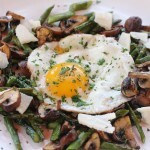 Asparagus, swiss, mushrooms, eggs…these are a few of my favorite things. That looks delicious and photographs beautifully. Great idea for a weeknight dinner. Thank you. These are a few of my favorite things too. The dish is simple and delicious, yes, I would love it for a quick weeknight dinner as well, enjoy. 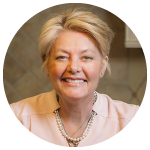 Thanks for joining in from… life according to Steph.com. Oh wow this looks so yummy, definitely a must try and great food blog by the way one of the best I’ve come across so far. Thanks for joining in and happy you liked the dish. Yes, I did enjoy your Post today and fashion photos see you again on Northeast Bloggers.